Last weekend, the Russian Air Force continued to carry out air raids against ISIS concentration centers near the city of Palmyra in the province of Homs. The Russian warplanes hit ISIS militants along the Sukhanah-Palmyra road inflicting a major damage on the militants’ military hardware. The Syrian Arab Army (SAA) and its allies stormed the ISIS’ positions in the oil-rich region of the Eastern part of Homs near oil well 101 and oil well 105. The SAA also targeted the ISIS strongholds in the Northern side of Quaryatayn killing and wounding several militants. The Syrian government has already deployed the Tiger Forces, the 18th Tank Division, the Desert Hawks Brigade and the Iraqi militia Liwaa Imam Al-‘Ali in order to supply the operation in Palmyra. On Mar.13 these forces launched an offensive on the Qal’at Tadmur overlooking the western part of the ancient city. Additional Hezbollah forces will be also reportedly deployed to the Palmyra front. On Mar.13, the clashes erupted between the Syrian Democratic Forces (SDF) and the terrorists near the town of Merkedeh in the Hasaka province. Meanwhile, at least five ISIS suicide cars were identified and destroyed by the Kurdish fighter before they were able to reach to the SDF strongholds bordering Tishrin dam in the Raqqa province. In the province of Latakia, the Syrian forces used their gains inside Jabal al-Akrad advancing on the town of Kabani from three different directions. Thus, the militants have only one way to retreat from the town. 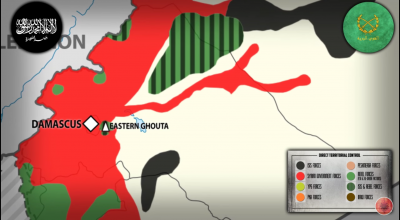 The pro-government forces used a similar pattern in their previous battles at Ghammam, Salma, Kinsibba, and Al-Rabi’ah. On Saturday, the Iraqi military media office released a statement claming that the forces had managed to establish complete control over al-Safiriya and Albu Tayban regions in the province of Anbar. Meanwhile, the pro-government Popular Mobilization Units repelled ISIS attempts to seize Ajil and Alas oilfields, located northeast of Salahuddin provincial capital city of Tikrit. With recent losses on the Syrian battlefield and the Russian air raids against oil smugglers, ISIS militants in Iraq has become cut from a major part of its funding sources. This sutiation has decreased the ISIS’ ability of open confrontation with the regular forces. Thus, it’s expected that ISIS will start to act in a guerrilla war style as a main approach. Marks of this we’ve been already seeing in Iraq.